I am so excited today because I have a special guest in the house. Please pour yourself a cup of tea or coffee, sit back and relax. I want to tell you about Rebecka who helms At Home with Rebecka out of Colorado. She is a mom, a grandmother, an awesome chef, and also a professional musician. Rebecka is also my friend and one who has given me much support and encouragement in our journey together as fellow bloggers. Rebecka’s blog is all about family, good food, and fond memories. 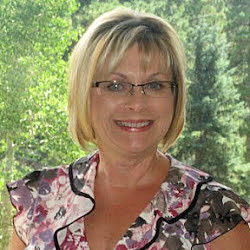 She shares fantastic recipes alongside family pictures and stories on her blog. She also enjoys competing in cooking competitions and loves singing in the opera. In her post entitled My Opera Journey Photo Album, you will be treated to some amazing pictures of her in various opera roles. She has performed in over 18 professional productions like My Fair Lady, Madame Butterfly, and Die Fledermaus. I wish I could have seen her in those productions. I hope you will visit Rebecka soon. You can also find her on Facebook, Twitter, and Pinterest. Hi, my name is Rebecka Evans. I was deeply honored when Biren asked me to write this guest post for Mother’s Day. I hope to do her blog justice as I try to live up to her impeccable standards! I stumbled upon Roti n Rice the first week of my food blogging sojourn. I was wowed by her exceptional blogging techniques, recipes and photography skills. What a pleasure to have Biren be my unwitting teacher these past two years as I’m continually inspired by each new blog post. I can’t imagine my blogging experience without her. Biren is a treasured fellow blogger. Thank you my friend! 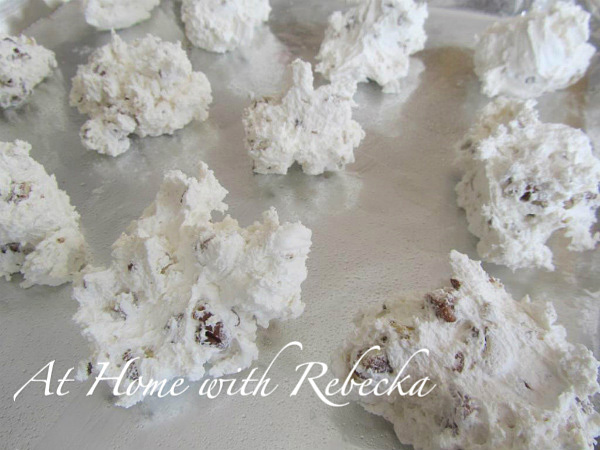 At Home with Rebecka is all about recreating fond food memories, what I like to call “A Culinary Journey of Comfort and Style”. My blog began on a whim and has since turned into a deep love for food blogging, an immense passion for food writing, styling and food photography! I also have to confess, I’ve become a food competitor junkie! I’ve had the honor of winning a few challenges in my food blogging career. 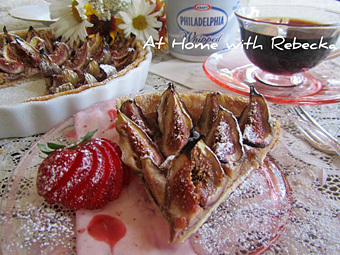 My most recent win, the Real Women of Philadelphia Cookbook Challenge with my Fig Tart with Philly Frangipani and Strawberry Ginger Cream. My photo and recipe will be published in this season’s cookbook alongside recipes from other RWOP winners and Ms. Paula Deen! Yea! I also won $500! Another proud moment was winning the Marx Foods Mixology Challenge, Recipe Impossible! My recipe Bite My Sweet Tarts-tini really had me thinking outside the box. The competition main ingredient… Szechuan buttons; a potent little flower with a tingly after bite! Please stop by my blog to view these recipes and more. 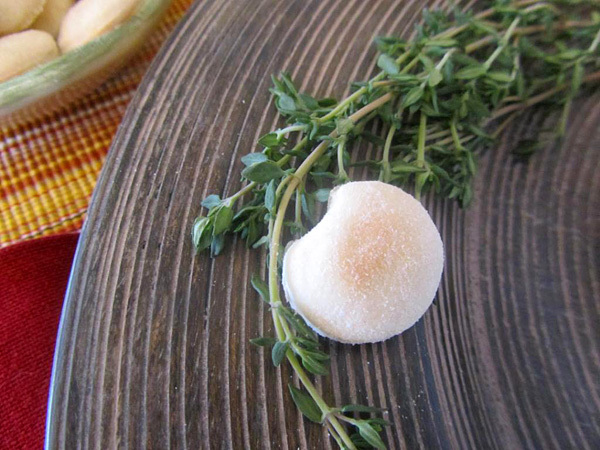 It’s Mothers Day, and what a perfect opportunity for me to share some delicious food memories with you by recreating three of my mother’s favorite dishes – Oyster Stew, homemade Oyster Crackers and Divinity. Mom aka Anne, was a masterful home cook. She was always eager to try new and unusual foods, way before they were popular or trendy. Garden to table, her recipes were inventive and delicious. I still remember her fried squash blossoms with a fresh cut garden salad, sweet hand picked cherry tomatoes tossed with tender blue sorrel blossoms and spicy chives, all dressed in sweet vinaigrette. While most of our family and friends were eating TV dinners we were enjoying mom’s culinary adventures. Mom is retired from the kitchen now, leaving preparation of holiday and big family meals to me and my three brothers. A torch I’m happy to share with future generations. Generally classified as a candy, fudge and sometimes used in a candy roll, Divinity is similar to nougat but lighter in texture; a cloud of soft sweetness with a pecan crunch. I guarantee this simply made candy will satisfy your biggest sweet tooth! Biren and loyal followers of Roti n Rice, Thank you! It’s been a pleasure sharing my mom’s favorite recipes with you today! Thank you Rebecka for such a beautiful post and your kind words about me. I hope you have a wonderful Mother’s Day. I miss my own Mom on this special day as she lives far away, but I got to talk to her over the phone last night. I am happy that I will be seeing her soon. Hi Rebecka – thank you for such a lovely post and for so generously sharing your mother’s wonderful recipes. I have never heard of divinity but as I love nougat, this is definitely something I would love to try making! The recipe that thrills me most though is the one for oyster crackers – never seen one for it and I am thrilled to see it here! Yes, it is really generous of Rebecka to share her mom’s recipes. Jeannie said something about divinity being called frangipani. I can’t recall having eaten anything similar in that part of the world. Any thoughts? Hi Biren! Lovely post and thanks for sharing Rebecka with us on this auspicious occasion. Thanks Nasifriet! Rebecka is wonderful – always encouraging and supportive. So glad to feature her here. What an honor to see my recipes here at Roti n Rice and to meet Biren’s dear followers! Denise, Jen and Nasifriet,I cherish your kind words! Great guest post from Rebecka. Love all the three dishes, look delicious and easy to follow. Thank you, Rebecka, Biren, for this wonderful post. The stew looks divine! Love those cute oyster crackers too. Thanks Angie! I love those cute oyster crackers too. Thanks Ramona! I hope you had a wonderful Mother’s Day too. Must be delicious! Thanks for introducing us a new blogger! Thank you Rebecka. I think I need to try the Oyster crackers this weekend. And teh divinity is the one waits in my list. I couldn’t do it now because it’s windy and get little rain here in my country. About the crackers, how is it taste? More to salty or sweet ones? If it is salty I was thinking to add chicken stuff. Oh wait I am back again. In the oyster crackers I need water and yeast. But I don’t see any of these ingredients in the instruction. So, when should I add them in the batch? Hi Yui! Thanks for visiting and commenting. Rebecka has responded to your question. Please read comment No. 15 below. I have also updated the recipe with the missing step. Biren, thank you for this wonderful guest post by Rebecka! Rebecka is just the best, isn’t she? Love all three recipes and can’t wait to try them. Oh, a new blogger to me! And a good one – really nice recipes. 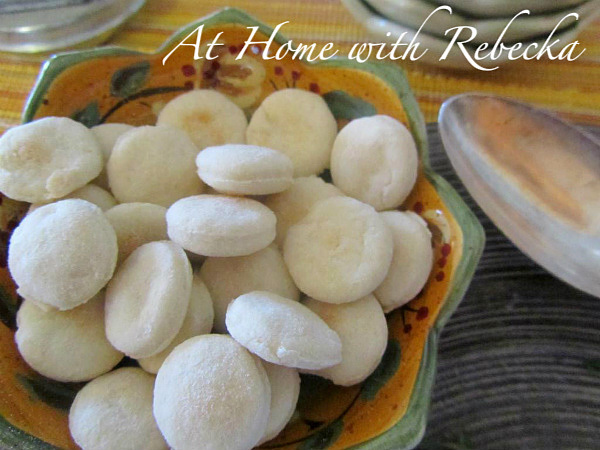 I’ve never made homemade Oyster Crackers – now I must! Thanks so much for this, and I’m on my way to check out Rebecka’s blog. Thanks so much for visiting Rebecka’s blog. I know you will not be disappointed. Hi Yui, I’m so sorry!! Just when I thought I had it all together for this guest post I leave out a vital step in the recipe! Missing step: in a small bowl combine 3 tablespoons milk and water, add yeast stir slightly with a wooden spoon. Rest mixture for 5 minutes. Add remaining 1/4 cup milk and yeast mixture to dry ingredients and blend until dough forms a ball. If the dough looks dry add another tablespoon cold milk. This recipe does not require warm water to activate the yeast. The crackers puff only slightly but get a lovely flavor from the yeast. The crackers are savory in flavor but if you prefer a saltier cracker, brush each cracker with egg wash prior to baking and sprinkle with sea salt. You can also add flavor by extending the baking time. This will produce a darker cracker with a nuttier flavor. I prefer the lighter version as it resembles the original version. Jeannie, The frangipani is absolutely delicious and super easy to make at home. I hope you have the opportunity to make the dessert and share it with your family and friends. It’s beautiful as well as delicious. Ramona, Kristi, Ann, Angie, PolaM, Joy aka kf, It has been my pleasure to share a few of my mother’s favorite recipes with you all. I am honored by your sweet comments and grinning ear to ear! kitchenriffs, Thank you for checking out my blog! I hope you enjoy making the oyster crackers. They are so yummy with any hot soup or stew! my grandmother used to make the best oyster stew. this brings back memories. She also used to make oyster crackers to go along with it! I love your version and hope you had a great mothers day! Love those oyster crackers :-). Many are loving those oyster crackers. So generous of Rebecka to share the recipe with us. Kitchen Belleicious, I love how certain recipes recall memories of friends and family. Most of my food memories are filled with love and joy however, I’ve had a few food moments I’ll need to blog about that weren’t so fond however, very memorable. I hope you try my recipes and let me know how they compare to your grandmother’s. cooking rookie, thank you for visiting my blog yesterday and leaving your kind comments! 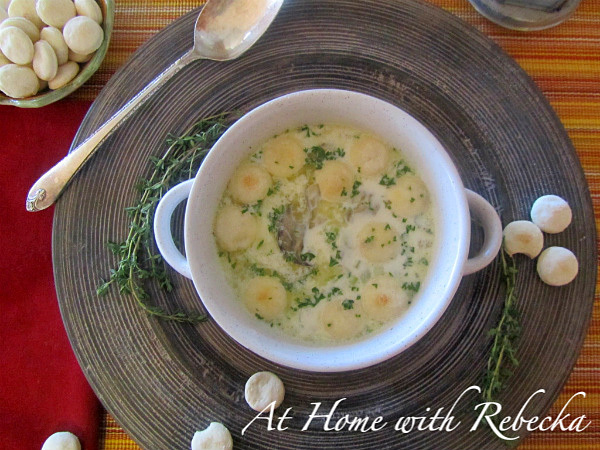 What a lovely guest post Rebecka, and such a fantastic stew! Hope you both had a delightful Mothers Day!